In this lesson, we will learn how to calculate the potential difference, current, and resistance at different points within simple parallel circuits. The diagram shows four circuits with components connected in parallel. 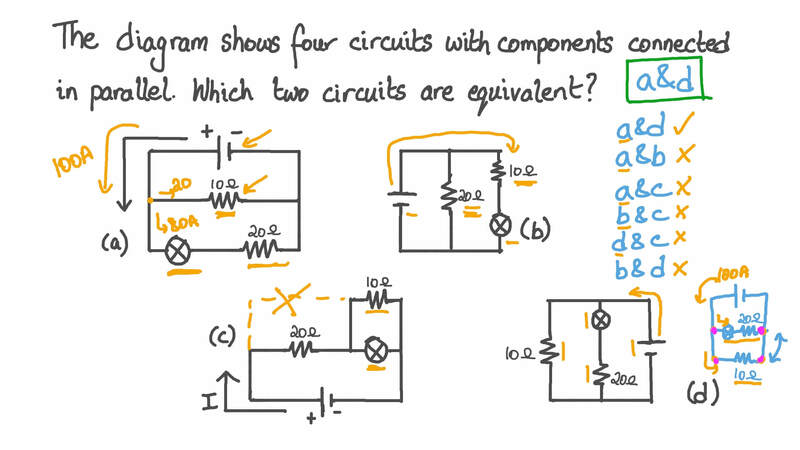 Which two circuits are equivalent? Mona sets up the circuit shown in the diagram. The current through the first ammeter, , is 5 A. What is the value of ? Give your answer to 1 decimal place. Isabella sets up the circuit shown in the diagram. Each resistor has a resistance of 10 Ω. The value of 𝐼 2 is initially 3 A. What is the value of 𝐼 t o t a l ? If 𝑆 1 is then closed, what happens to the value of 𝐼 2 ? 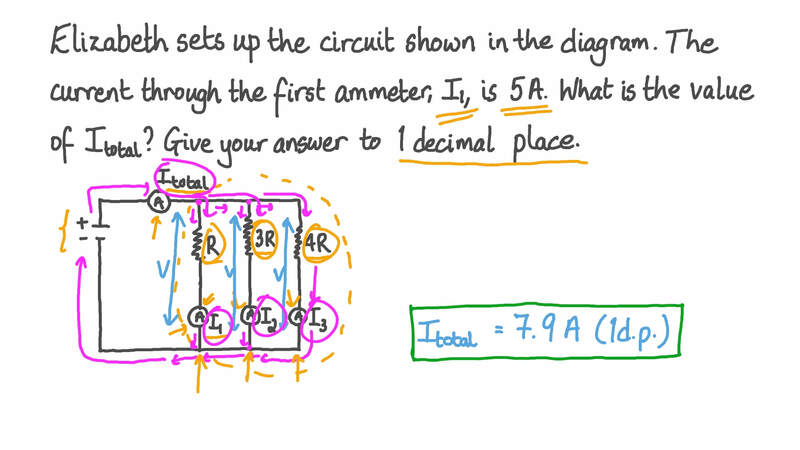 With 𝑆 1 still closed, is the resistance of the circuit lower than, higher than, or the same as it was when 𝑆 1 was open? 𝑆 1 and 𝑆 3 are kept closed, but 𝑆 2 is opened. 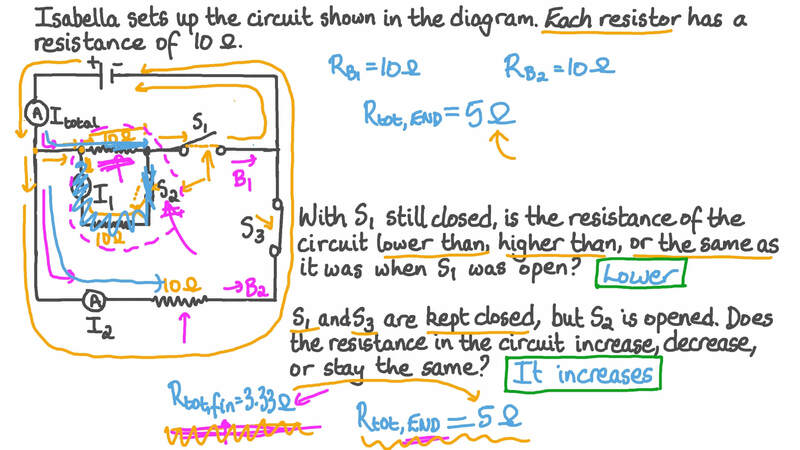 Does the resistance in the circuit increase, decrease, or stay the same? A student sets up the circuit shown in the diagram. Initially, switch 1 is closed and switch 2 is open. If she opens switch 1 and closes switch 2, will the current in the circuit increase or decrease? A student sets up the circuit shown in the diagram. Initially, the switch is open. When the student closes the switch, will the current flowing through the circuit increase or decrease? The circuit shown in the diagram consists of two resistors connected in parallel to a cell. The value of 𝐼 t o t a l is equal to 30 A. What is the value of 𝐼  ? The circuit shown in the diagram consists of two resistors connected in parallel to a cell. The value of the current given by the second ammeter, 𝐼 2 , is 3 A. What is the value of 𝐼 t o t a l ? A student sets up the circuit shown in the diagram. The three resistors are identical. The value of 𝐼 t o t a l is 15 A. What is the value of 𝐼 3 ? A student sets up the circuit shown in the diagram. The value of 𝐼 t o t a l is 8 A and the value of 𝐼 1 is 6 A. What is the value of 𝐼 2 ? What is the potential difference supplied by the cell to the circuit? The diagram shows two resistors connected in parallel to a cell. If the potential difference across the 3 Ω resistor is 18 V, what is the potential difference across the 6 Ω resistor? The diagram shows two circuits. Are the circuits equivalent? If not, why not? CYes, the circuits are equivalent. The diagram shows four circuits. Which circuit contains two resistors in parallel? The diagram shows four circuits. Which one shows a fuse and a filament lamp connected to a cell in parallel?